So, I’m at that point. I am close to reaching the beginning of my sixth year blogging. In the six years that I have been blogging and writing and putting words on paper, I have steadily been moving closer and closer to this dream of becoming a published author. At first I was just writing to put words on paper. I used blogging as a way to share my story and my life with others. Then, as time progressed and I got older and wiser, I started to realize that dreams don’t come true for the people who sit back and let life happen around them. Dreams come true for the chasers, the workers, the hold-oners even when things get tough and it seems like there is no reason to continue on. Well, I’ve decided to be a chaser, worker, and hold-oner. This is where my publishing story begins. I don’t know what the future holds for me, if anyone will like my story, if I’m even heading in the right direction. Here’s what I do know, I never thought I could finish a novel, until I did. I never thought I could run 13.1 miles, until I did. I’ll never know if I can be published if I don’t try. 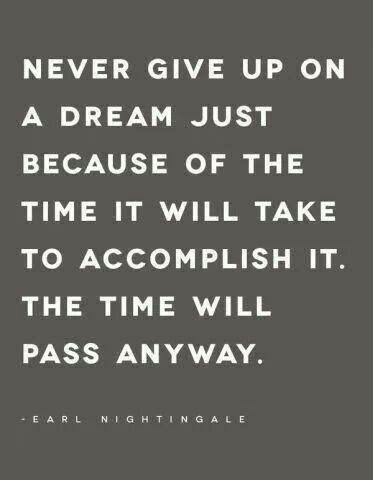 And time will pass either way, whether I’m in training, whether I’m trying to get published or not. This is what I have done: I’ve had several people read and comment on and help me with my first novel, Look to the Sky. I literally have no idea what I’m doing as far as publishing, so I’m doing a lot of research right now. The list of agents that I think might be a good fit for me is growing while I work on a draft of my query letter. I’ve sent out requests for help from mentors. All I know is that I’m ready to start this publishing journey. This is where I’ll keep you all up to date. This is were you will all see what I’m doing, when I get rejected, how I cope with it all. I don’t know what the future holds for me. Maybe I was too optimistic calling this my publishing journey when there is every chance that I won’t get published. That’s okay. This is a dream, and it’s time to chase it. Now, all I have to do is figure out how to juggle writing a new novel, querying agents for a previous novel, and doing all the other things that make this my life.